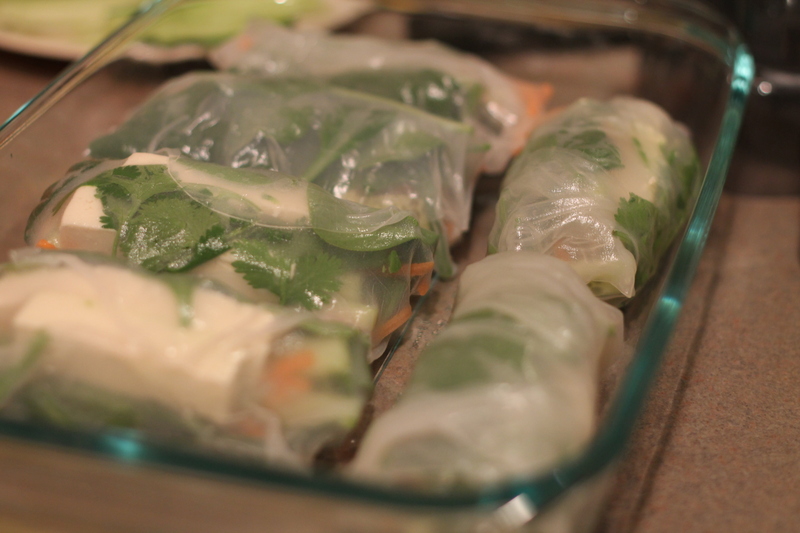 I had never attempted to make them at home because I was always a little intimidated by the rice paper. I kinda put it on the same level as filo dough: thin, fragile, and difficult to work with. I decided to face my “fear” and try to make them this week, and I learned that they’re actually quite easy (and fun!) to make. And you can mix and match ’em, filling them with whatever you want! 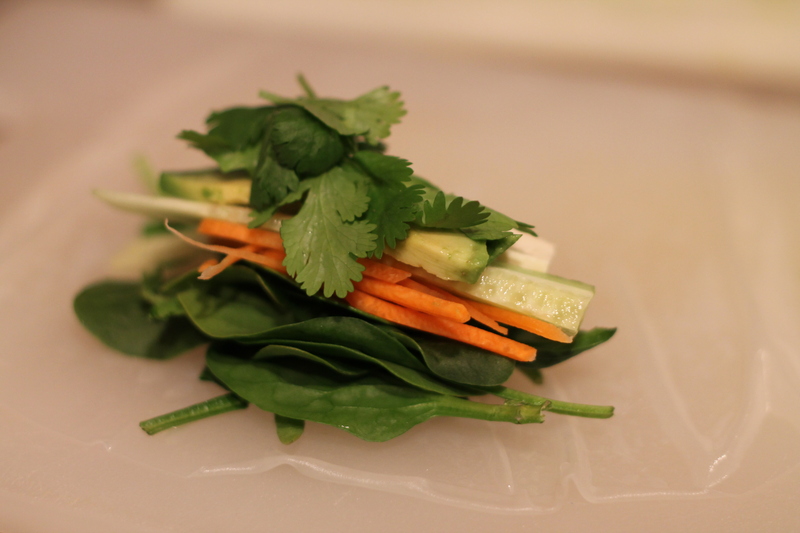 So, without further ado, here’s how to make spring rolls! Then, I prep your fillings. Cut your veggies, boil the vermicelli noodles, cook your shrimp, etc. 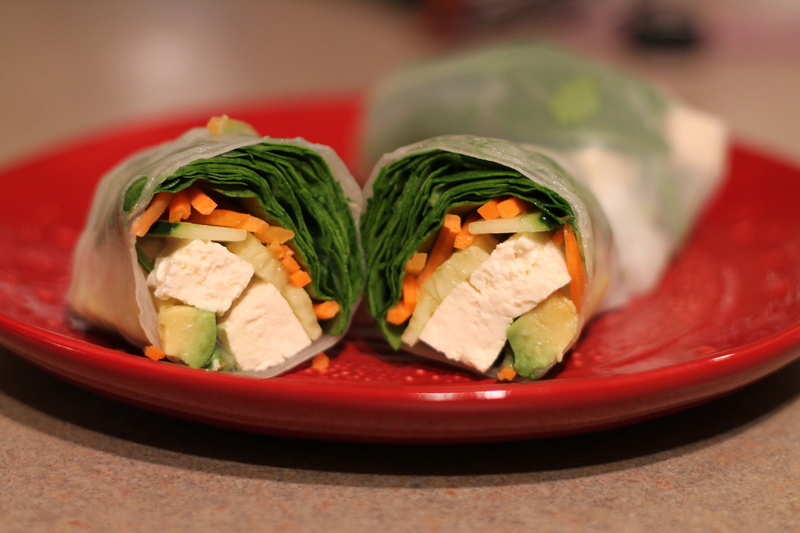 You’ll want to have all of this done before you start assembling the rolls. There’s no time to cut up the cukes in the middle of it all! 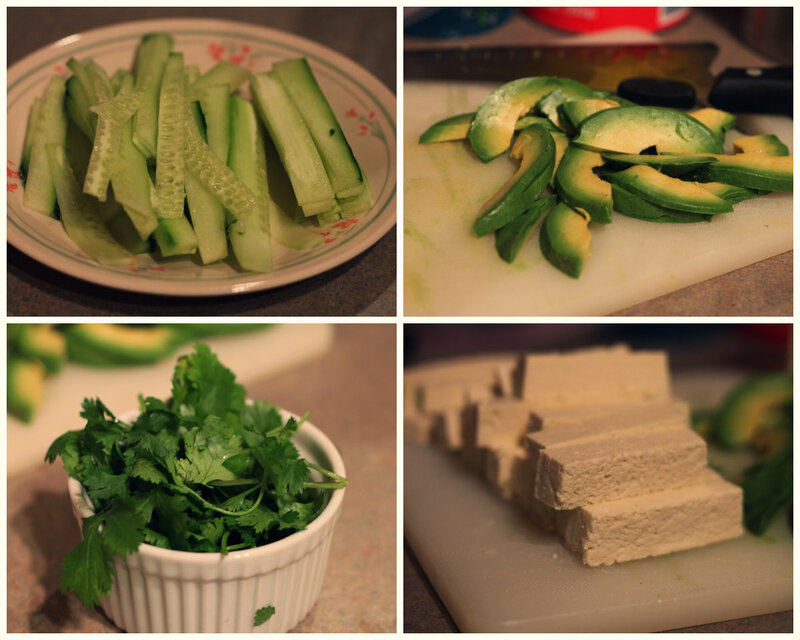 I wanted to make a vegetarian version, so I cut up a cucumber, an avocado, some cilantro, and some tofu. I also cheated and bought pre-shredded carrots, and a bag of spinach. You’ll also want to turn on some water to get hot- warmer than luke warm but definitely not boiling. Figure out your work space. You’ll need a shallow dish that is big enough to fit the wrappers in, and that should be placed next to where you will be filling and rolling your rolls. And of course, all of your fillings should be easy to reach from your work station. When everything is prepped, it is time to get to work! 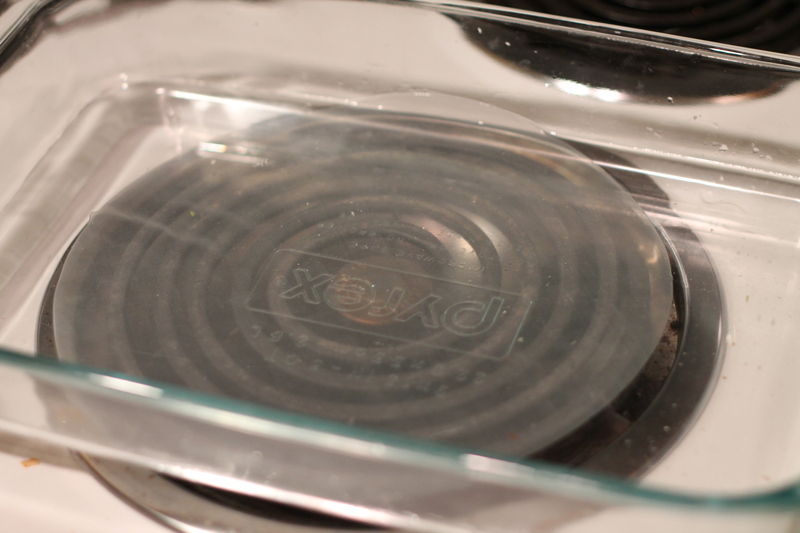 Fill a shallow dish with about 1/2″ of the hot water. 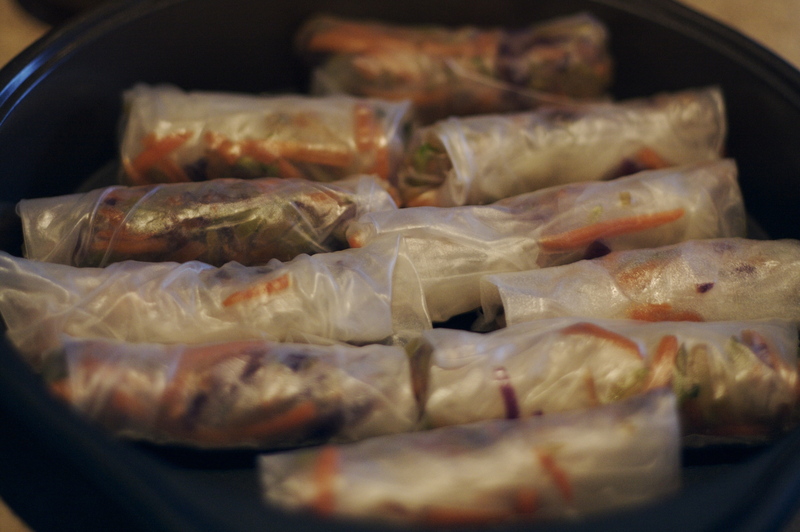 Place the rice paper wrapper in the water for about 20 seconds, or until it becomes pliable. You’ll want to make sure it is nice and soft before you pull it out of the water. When you take it out of the water, don’t just grab the top of the wrapper, but rather use two hands at about 10 and 2 (like driving a car, right?) and spread your fingers some to keep the paper from sticking to itself. Hold the wrapper above the water for a few seconds to let the water drain, and then lay it down as flat as you can on your work surface. Now it’s time for the fun part! Stuff the roll with whatever toppings you want! Lay the toppings about 2 inches or so from the side of the wrapper closest to you. 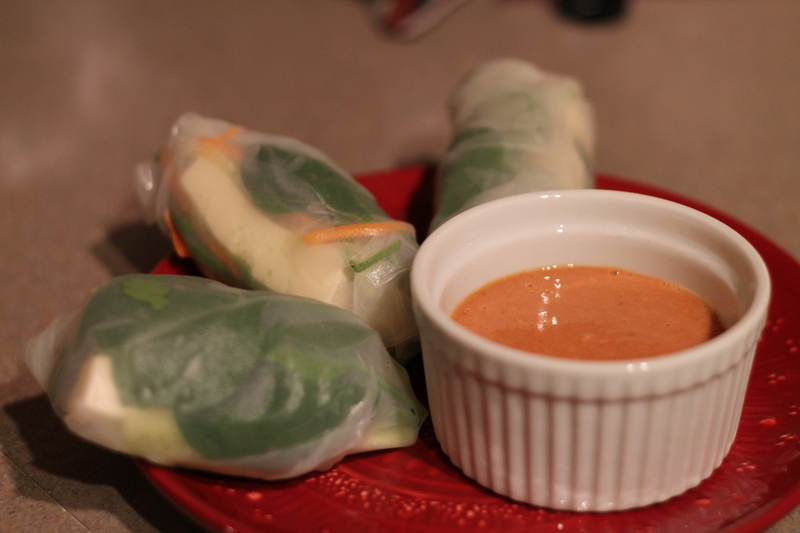 I served mine with Mama Pea’s Peanut Mmm Sauce, and it went perfectly! 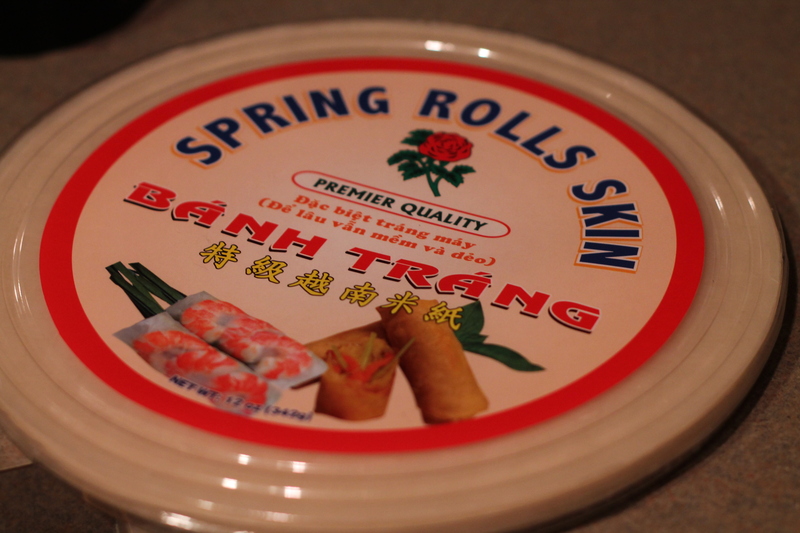 So, if you were ever wanted to try making some spring rolls at home, go out there and do it! Yes, it makes so many! YUM! my favorite thing to order as an appetizer. I am definitely going to make my own. So easy and I bet it’s way more cost effective. I should do the calculations to figure it out! I think it probably more economical ! Thank you for telling me where to get the wrappers! I keep meaning to go to an Asian grocery to get some but they’re so far away. I’m going to check my whole foods next time I’m there. Awesome! I was glad WF had them! But it would be an excuse to head to a new grocery store to explore! So glad you posted this. One of those things I’d always love to try and make but had no idea how to go about it. Looks good! I love cafe Asia! I go there all the time.